Diametriq, an innovator in Diameter signaling control technologies, offers an exceptional suite of Diameter Signaling Controller (DSC) solutions. The Diameter Solution Suite™(DSS) can be configured to your specific network requirements. The Evolved Packet Core (EPC) uses Diameter for access to the HSS and PCRF. The HSS is used to obtain subscriber data and, when there are a large number of subscribers, they may be partitioned across multiple HSS instances deployed in a network. Similarly for the PCRF, there may be multiple instances of the PCRF so load balancing is required. Additionally for the PCRF, multiple Diameter interfaces for the same UE/session need to select the same instance; this is called binding. The 3GPP defines the Diameter Routing Agent (DRA) entity to select the correct instance. Additionally, for roaming where the visited PLMN also supports LTE, there is a need to provide border security and topology hiding at the edge of both the visited and home PLMNs. The GSMA defines the Diameter Edge Agent (DEA) to perform this function. The logic to load balance across multiple instances, bind requests and perform edge security may be done at the requesting element, e.g., MME, SGSN, V-PCEF. However, this results in an inefficient mesh network that is difficult to manage. The DSS can be deployed in the EPC to act as a DRA and DEA at the same time. All elements connect to the DRE and all Diameter traffic passes through the DSS. 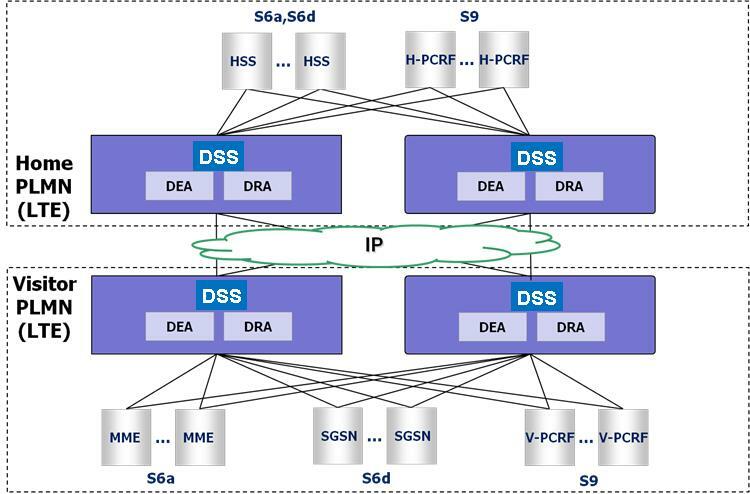 The DSS examines the Diameter messages and performs load balancing and binding across the multiple instances of the HSS and H-PCRF. The DSS is deployed at the edge of the home and visited PLMN and optionally in a geographic redundant configuration for disaster recovery. This results in a more efficient network that is easier to manage.